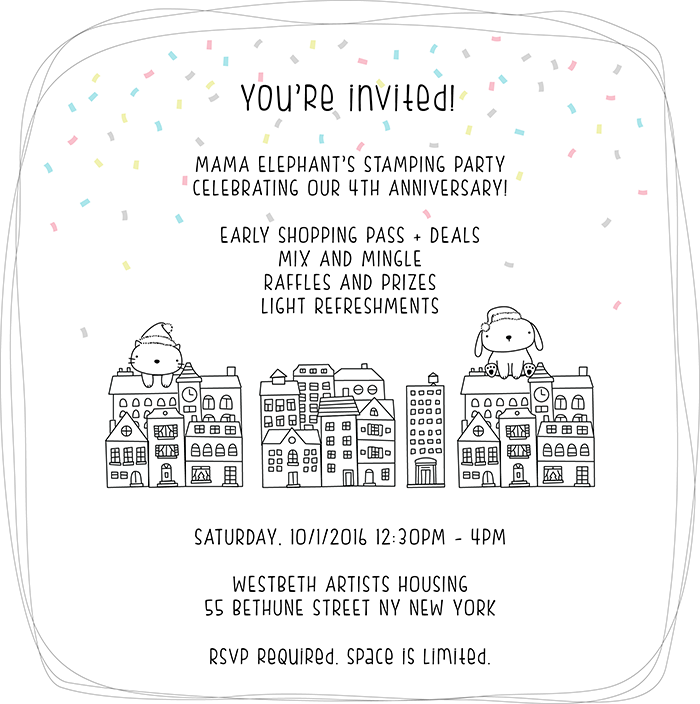 mama elephant | design blog: ME PARTY IN NYC CELEBRATING 4 YEARS! ME PARTY IN NYC CELEBRATING 4 YEARS! Hi friends, it's that time of the year again! That's right, Mama Elephant will be turning 4 this October and we are back to celebrate with you in person and of course online with everyone! Please note, that to prepare for the festivities, we are taking September off, so no release September! Instead, we will be bringing you a special anniversary release! Just like we do every year! NYC folks, time to don your party hats again! Join us as we host our annual stamping party on Saturday, October 1st at Westbeth Artists Housing for a day of stamping, shopping, and connecting with old and new friends! Because of the overwhelming response to our party and limited space, tickets are absolutely required this year. Last year was a sold out event, we expect it to sell out again this year! So act fast! To get your free ticket (and to qualify for raffles), please register at the link below. One registration ticket per person. Every person must register individually. Tickets will be collected at the entrance. The pop-up shop is CASH ONLY. Sorry no credit cards/checks will be accepted. Bring your own basic supplies (stamp block, inks, scissors, adhesives, coloring, etc.). If for some reason you may not be able to attend the party, please let us know so we can open up a spot for someone else! Woo hoo!!! Can't wait for October 1st and the special anniversary release. ;) Also looking forward to actually attending this year too!! Wouldn't miss it! Please get my sister to come from Cali! How fun!!! I'm going to have to come back to New York one of these days to say hi!! I'm so sad that I can't go this year....but looking forward to seeing pics on IG! Looks like I'll be able to make it this year!!! so wish I could join you!! Thanks for the invite! Use to live in Ny and I really miss it. All packed & ready to go! !